AXIOM provides a very comprehensive Change Audit table which can track many different changes in the AXIOM program. Unfortunately, these changes can accumulate very quickly, resulting in a Change Audit table that grows to such proportions that it impedes performance of the entire AXIOM program. System Administrators are left with two choices, either live with decaying performance, or purge valuable information from the system to keep the Change Audit table within manageable limits. CHARTBuild builds a series of Microsoft Visual FoxPro (VFP) tables which contain the extracted information. VFP tables have a 2 GB limit, so multiple tables have to be built. This is not a problem because subsequent VFP SQL calls to retrieve the information support the UNION clause, allowing one SQL call to span many tables. If CHARTBuild is fired automatically using the Windows Scheduled Tasks routine, Step 1 above (Retrieve Last Week's Data from AXIOM Chg_audit Table) automatically fires. 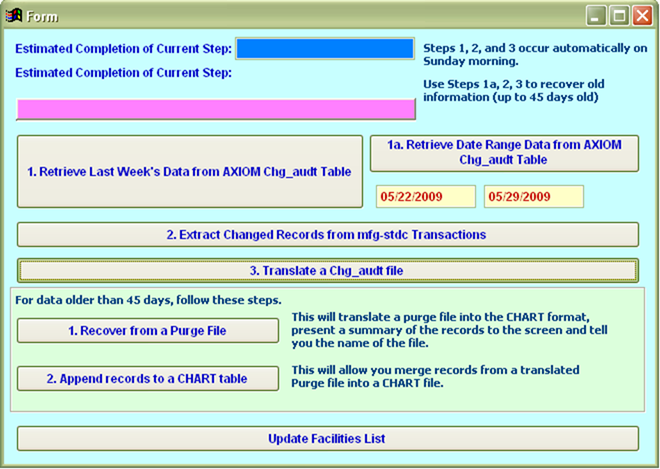 One also has the option to run CHARTBuild on any date range as well as recover information from purge files previously made using the AXIOM purge utility. 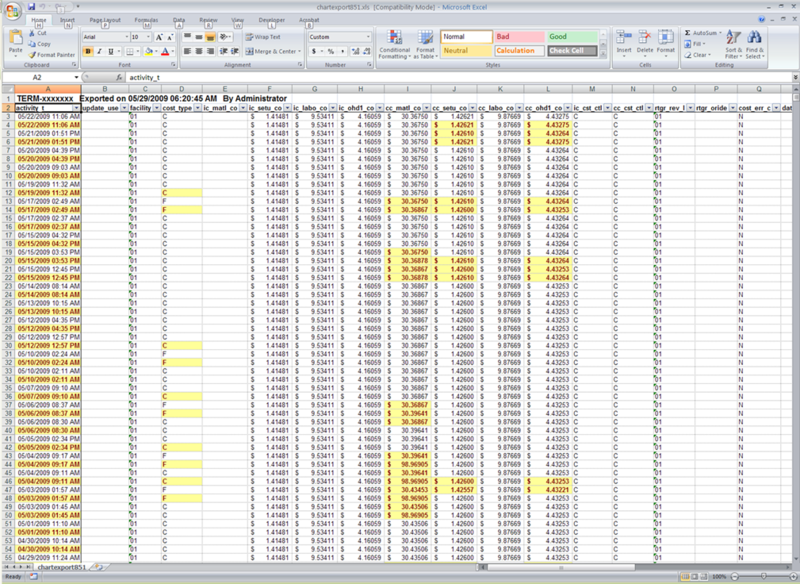 When users wish to extract information from the VFP tables, the CHART Utility is used. In this example, CHART is configured to extract cost changes. One simply enters the desired part number to obtain in a few seconds the entire cost change history of a product in reverse chronological order.